PAWTUCKET, R.I. - The Pawtucket Red Sox (6-4) have now won two-straight series after winning the fourth and final game of their series with the Syracuse Mets (6-5) by a final of 5-4. For the second straight game, the PawSox struck first offensively. Josh Ockimey (1-for-3, 2-R HR, 3 RBI, BB, SO) drew a walk with the bases loaded to give Pawtucket a 1-0 lead. Ockimey has now drawn a walk in seven straight games. But the Mets responded in the very next inning. Tim Tebow (1-for-3, RBI, BB, SO) lined a two-out, RBI single to right field to tie the game at one. Syracuse took the lead in the top of the third inning thanks to an RBI double from Dilson Herrera (1-for-4, 2B, RBI). The Mets hit five doubles in the contest. The PawSox tied the game in the fifth inning on an RBI single from Rusney Castillo (3-for-4, 2B, RBI, R), who collected his second-straight, multiple-hit game. 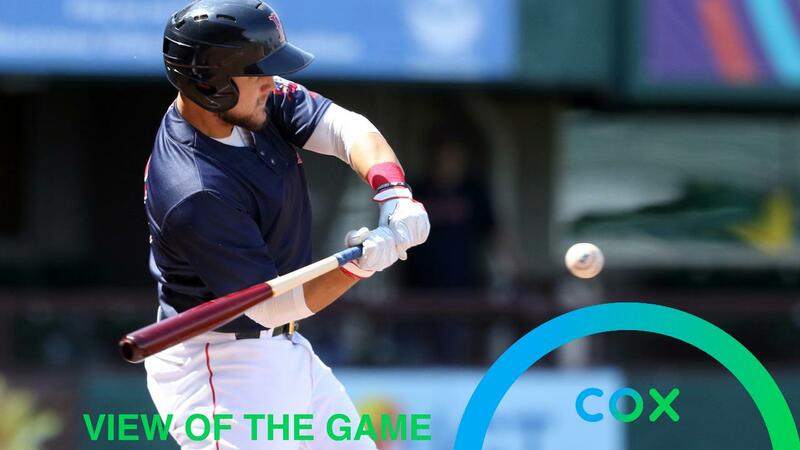 In the sixth inning, Michael Chavis (2-for-4, HR) hit a solo homer that gave Pawtucket a 3-2 lead. It was the second-straight game with a home run for Chavis. This shot left the bat at 109 miles-per-hour and traveled an estimated 467 feet. After Sam Travis (0-for-2, R, BB, HBP, 2 SO) was hit by a pitch, Ockimey hit an opposite-field, two-run home run to make it 5-2. The Mets came right back in the top of the seventh inning and scored a pair on a two-run shot from Carlos Gomez (2-for-4, 2B, 2 RBI, 2 R, BB), who was just 2 for his last 15 prior to that at bat. In his home debut, PawSox hurler Ryan Weber went 5 innings allowing 6 hits and 2 earned runs while walking 1 and striking out 3. Weber retired the final eight batters he faced. The PawSox begin a four-game series with the Buffalo Bisons on Monday at 6:05 p.m. Pawtucket right-hander Mike Shawaryn (1-0, 3.18 ERA) is scheduled to oppose Bisons righty Jacob Waguespack (1-1, 5.23 ERA). Radio coverage on WHJJ (920 AM and 104.7 FM) and throughout the PawSox Radio Network begins with the pre-game show at 5:35 p.m. The seven-game homestand at McCoy Stadium runs Thursday-Wednesday (April 11-17). Good tickets are available, and fans can visit the McCoy Stadium box office, which is open Monday-Friday from 9 a.m. through 5 p.m., and during all home games. Fans can also call (401) 724-7300 or log on to PawSox.com for tickets.